Baroque Tango #3, 2018. Acrylic on canvas. 40 x 80 inches. 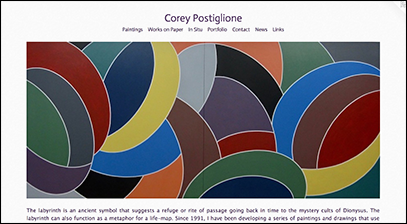 COREY POSTIGLIONE's paintings use the visual language of geometric abstraction in combination with the literary device of metaphor. 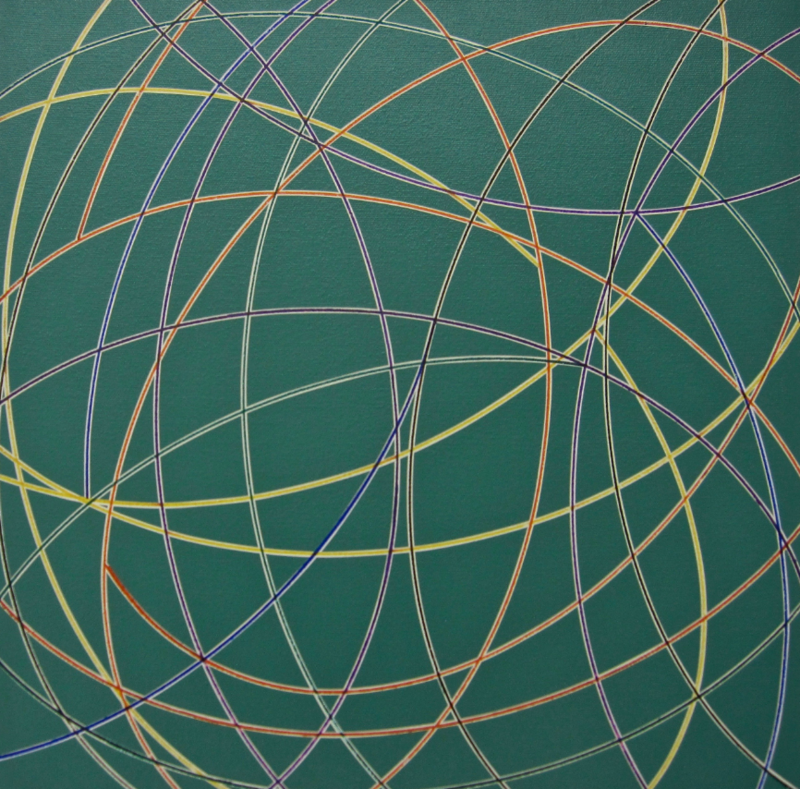 In crisp, flat color, he returns again and again to the curved line, the oval and the interlocking chain, allowing the meaning of these recurring forms to shift from painting to painting. Corey received a BFA in Studio Arts at the University of Illinois at Chicago and a MA in Art History and Critical Theory from the School of The Art Institute of Chicago. 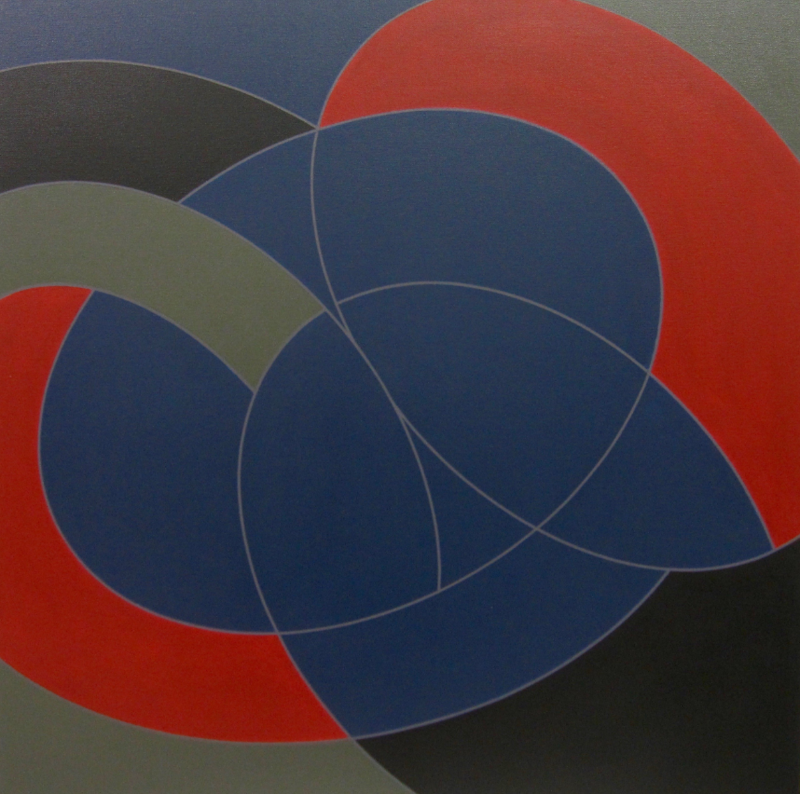 He has exhibited widely since the 1970s with solo shows at Thomas Masters Gallery (Chicago), Westbrook Modern Gallery (Carmel, CA) and Jan Cicero Gallery (Chicago), among others. In addition to his career as a practicing artist, his critical writing has been published in Artforum, The New Art Examiner, Dialogue, and C-Magazine (Toronto). He was a founding member of the Chicago Art Critics Association. He is currently Professor Emeritus from Columbia College Chicago where he taught Art History and Critical Theory as well as studio arts for over 25 years. You can see his work through March 1, 2019 in Curators Create Second Biennial at the Bridgeport Art Center (Chicago). Corey lives and works in Chicago. OtherPeoplesPixels: How do geometric abstraction and metaphor work together in your paintings? Are they balanced equally, or does one drive the work more? Corey Postiglione: This question is essential to my entire artistic practice, which extends over many years. I have always been attracted to the possibilities of abstraction—especially the geometric style— for its formal innovation, its freedom for color, no longer restricted to nature, and its potential for ambiguity of content. This last is where I have used abstraction for its metaphorical possibilities referencing such things as population growth (the Exponential series) or the recent effects of globalization (the Tango series). Also in this regard, the concept of personal “life paths” began with the Labyrinth series in the early 90s. Vortex # 14, 2017. Acrylic on canvas. 16 x 16 inches. OPP: Your titles are significant in terms of pointing to the metaphors, which are still quite open to interpretation. What do Tangos, Vortexes and Lines of Flight have in common? CP: All these series rely on certain themes mentioned above, a visual complexity or conundrum; the lines suggest flight or trajectories. In fact I named one series of works Lines of Flight, for the possibility of escape. The Vortex series just increases the above concepts of visual complexity in the extreme as a metaphor for our current condition: where do we fit in this complex network of international globalization. Dancer in the Dark #2, 2016. Acrylic on canvas. 30 x 30 inches. OPP: You’ve been working with recurring visual motifs for at least 15 years (if not more). What keeps you excited about curved lines, ovals and interlocking chains? Are you ever tempted to paint something drastically different? 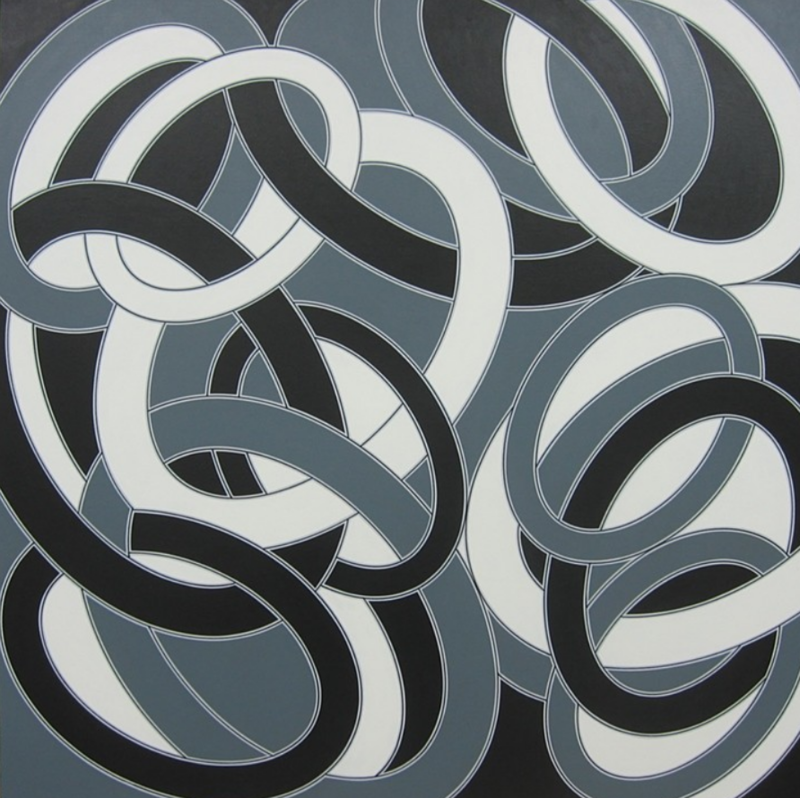 CP: Since the 2000s, I have mainly used curved forms, ovals, circles, to further my themes of complexity and interconnectedness. Moreover, what I like about using these curved forms is that they can be both mathematically geometric but at the same time suggest organic images. The artist Robert Mangold, one of my early heroes, has said that when you reach a certain point in a series and it no longer provides a new and exciting place to go. In other words, when you have exhausted the possibilities, then you need to move on. This is excellent advice and one I take very seriously. Cezanne’s’ doubt is always hovering over you in the studio. However, these forms continue to supply me with new and exciting ways to create fresh work. But when that time comes, when I feel these forms are no longer providing new and innovative visual possibilities, I will take Mangold’s advice and move on. Tango Primary WBG, 2012. Acrylic on canvas. 40" x 40." OPP: You’ve written that you are “inspired by the great utopian notions of late modernism (the cult of the right angle),” but it seems you haven’t painted a right angle lately. How would you describe your relationship to Modernism? CP: This is a very complex question but a good one. In the early 90s, I started to question the notion that Modernism—or maybe more precisely Modernity—could solve the world’s problems through technology, science, design and aesthetics. I specifically titled a piece Utopian Dreams, visually referencing these doubts. We also saw the rise of Postmodernism(s) that critiqued traditional modernism. I never rejected the right angle, and some of the early Labyrinth series incorporated a stricter geometry. The curved forms just provided me with a more complex lexicon of visual potential that would better serve my personal and political content. 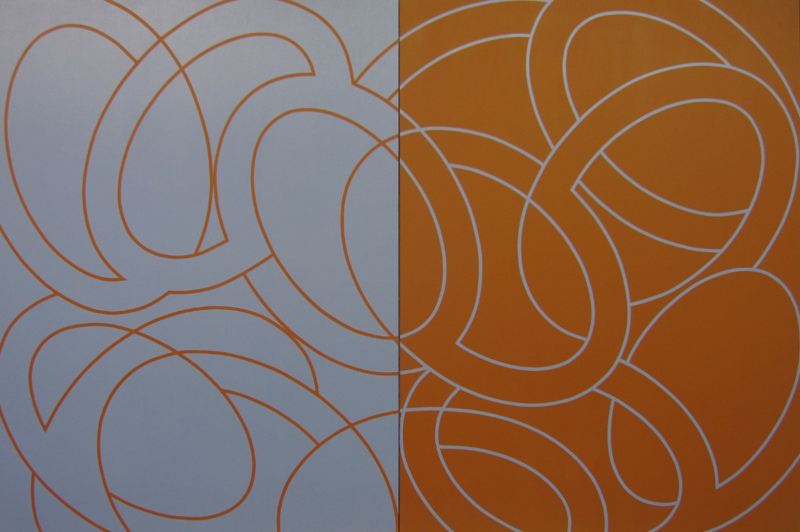 Tango Eclipse Diptych, 2015. Acrylic on canvas. 40 x 60 inches. OPP: What’s happening in your studio right now? CP: I am continuing to explore new visual permutations with these curved forms. I am currently working on The Baroque Tango series. It follows the extravagant ideas imbedded in the concept of the Baroque: a rich and strong palette, emphasis on movement across the pictorial field and spatial complexity. It should be noted that as much as I strive to embody my abstraction with life-world content, I have always tried to make work that was visually generous in color and form. In other words, I want the work to seduce the viewer. I want the work to also be about the pleasure of the aesthetic experience, what Andrea K. Scott recently referred to as “retinal pleasure.” This is whether one gets what ideas are behind the making of the work. Otherwise I would just put up a didactic written statement. No, I am still an advocate of Visual Art with the emphasis on the visual. To see more of Corey's work, please visit coreypostiglione.com.